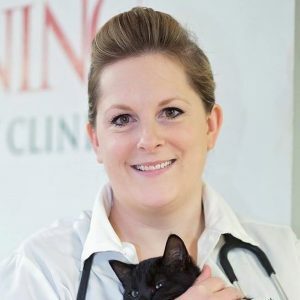 Back in 1999, Jennifer decided that she wanted to pursue a career in veterinary medicine with aspirations of one day being her own boss and she moved from Calgary to Manning to save money to pursue her goals. She became a permanent resident of Manning when she married into the community and decided to raise a family here with her husband Todd. She realized her dream in January 2015 when she opened up the Manning Veterinary Clinic. 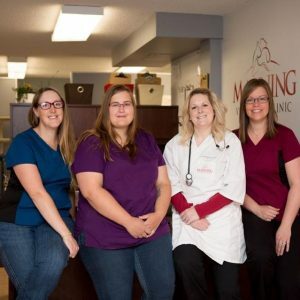 She chose to take the leap to practice ownership because there was a need for veterinary services in Manning and the surrounding communities. Furthermore, practicing out of Manning has allowed her to be more available for her family and community involvement. Why veterinary medicine you ask? Dr. McCracken has always loved animals and had an interest in health care so a career in veterinary medicine only seemed natural. Jennifer says the best part of her job, besides the interactions with the owner’s of her patients, is knowing that she has made a difference in the quality of life of an animal. Whether it be through making the proper diagnosis and providing treatment or to know that she has done her part to prevent an illness, she loves being able to help many animals feel more comfortable. Jennifer started off her education at the Grande Prairie Regional College for 2.5 years. She moved to Edmonton to attend the University of Alberta for a year after that. She then went on to graduate from the four year Doctor or Veterinary Medicine program at the Western College of Veterinary Medicine in 2009. As a mixed animal veterinarian, Dr. McCracken works mainly on dogs, cats, horses and cattle. She is always up to the challenge to work on any species that comes into the practice. Her favourite animal to work on are dogs because 90% of the time they are happy to see her. There is nothing better than a litter of puppies breaking up the appointments during the day, except of course, a litter of kittens. She also really enjoys visiting with producers when out of farm calls. She says there is something so relaxing about shooting the breeze with the local farmers while working on cattle and that it doesn’t even feel like work! Jennifer and her husband Todd live east of town on a farm with their two children – Kendall and Kade. They have 2 cats named Benny, Albert, and 2 dogs named Major and Bear. They also have over 30 horses on farm as her husband Todd races thoroughbred chuckwagons on the WCA circuit which fills their family’s summer schedule. The McCracken family farm cares for cattle, horses, goats, donkeys, pigs, and a llama named Bruce. Kaitie Koch started working at the Manning Vet Clinic in August of 2015 and has moved into the role of Office Manager. She grew up in Manning and after a few years pursuing various interests at post secondary institutions, Kaitie returned to Manning. 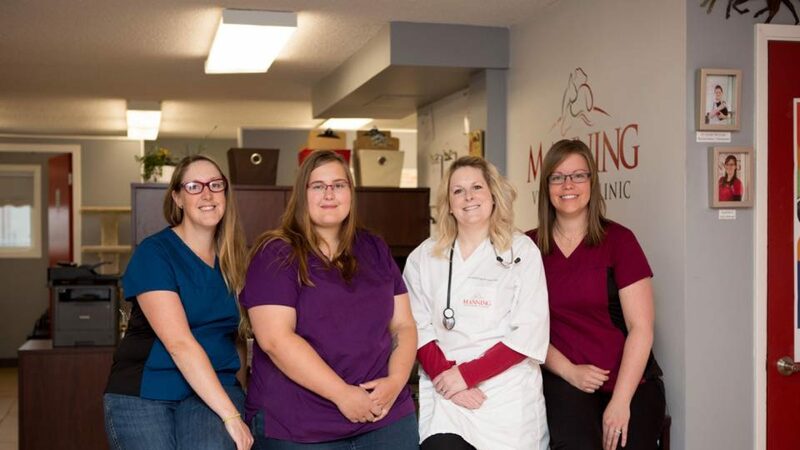 Having always had a love for animals, working at the Manning Vet Clinic was a natural fit. She genuinely enjoys her role at the clinic and looks forward to many years of helping to care for your pets. Kaitie currently enjoys the company of four canine friends, one cat, and two horses.